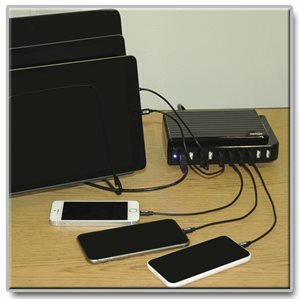 For the battery-intensive mobile devices of today, a standard USB hub is not sufficient for charging. Tripp Lite's U280-010 10-Port USB Charger is the solution, allowing you to charge up to 10 tablets, phones or other mobile devices all at the same time. Up to 5V, 2.4A (12 Watts) of power is provided to each port, perfect for charging the most power hungry devices such as the Apple iPad. With a maximum of 105W, you can provide up to 5V, 2.1A per port simultaneously. So whether you're at home or in the office, you no longer need to go looking for an available outlet or unplug one device to charge the other, the U280-010 provides you with the ports and power you need. Features over-heating, over-current, and over-charging (stops charging when device battery is full) protection. Includes an internal, dual-voltage (100-240V) power supply - no bulky external power supply required. At home or in the office, Tripp Lite’s U280-010 10-Port USB Charger provides enough power and ports to keep your devices at 100% capacity. No more peering behind furniture to find an available outlet or unplugging one device to charge another. This compact charging station charges up to 10 devices at the same time, including smartphones, tablets and MP3 players. It doesn’t require a computer, so you can take it anywhere AC power is available. The U280-010 simultaneously provides up to 5V, 2.1A of power per port at maximum capacity. Each individual port is capable of delivering up to 5V, 2.4A, which is enough for charging even battery-intensive devices like the Apple® iPad®. An included rubber stand allows you to position the U280-010 vertically on your desktop to save space. To charge your USB devices, simply plug the charger into any standard NEMA 5-15R outlet (internal dual-voltage (100V–240V) power supply included—no external power supply required), turn on the rear on/off switch, and connect your devices to the available USB ports. The U280-010 protects against overheating, overcurrent and overcharging—in fact, it stops charging as soon as your devices’ batteries reach capacity. A front LED indicates the unit is turned on and receiving AC power. The U280-010 comes with a two-year warranty. It’s manufactured in compliance with strict RoHS specifications, reflecting Tripp Lite’s commitment to environmental responsibility. C13 to 5-15P Power Cord, 3 ft.